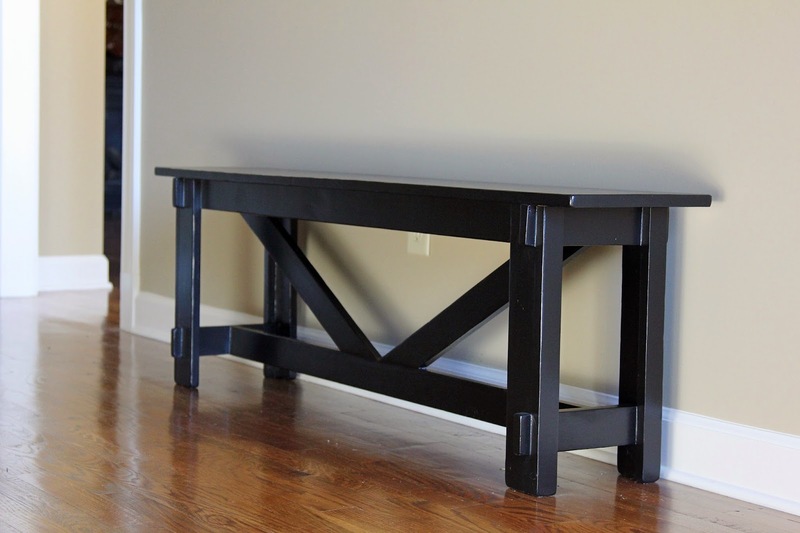 This is made from another Ana White plan, the "Large Rustic X Bench" plan to be exact. See, I have always been in love with this plain, yet easy to personalize entry from Pottery Barn's website. I won't go into the details of the plan since Ana White lays them out plain and simple for you HERE, but I will show you a pic I took during the "tricky" step #4. Per Ana's website, "What you will need to do on the end cut at two different angles, is first mark out the 60 degree angle from the top corner (when imagining the board in place on the bench). Also mark and cut the bottom angle. Then cut these angles and fit on the bench. Center the bottom on the stretcher. Then mark off where the top overhangs the top of the bench and clip off. This cut does not have to be perfect – you will just need to make sure it sits lower than the top of the bench." So using a protractor, I marked my angles. Then I rigged the board on my miter saw. 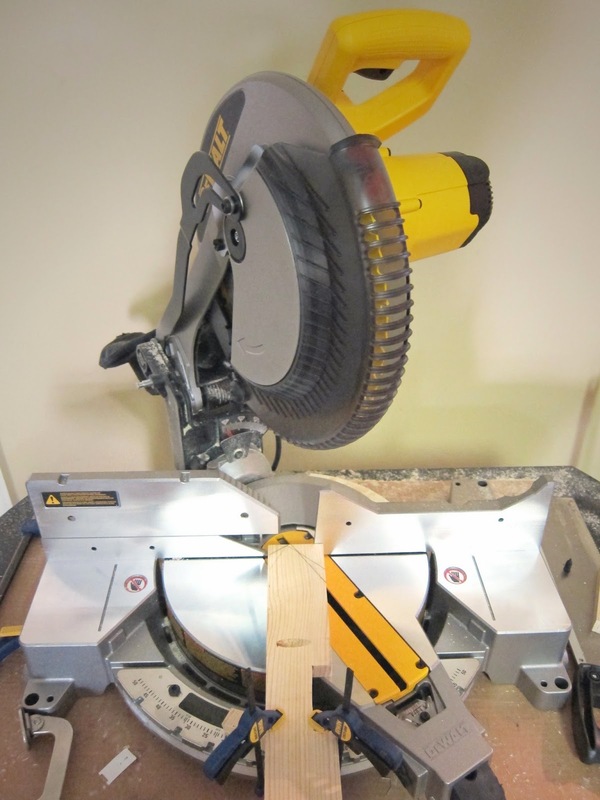 See the pic below...I have the board clamped onto the front of my miter saw. I couldn't figure it out otherwise. Either way this worked. 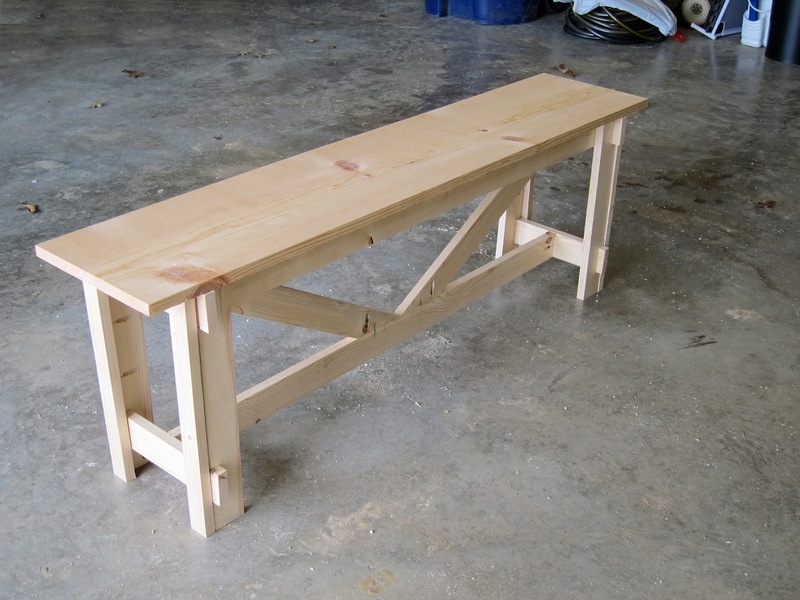 And here is my bench after Step #6 before I attached the leg pieces or the bench top. This lets you see where all I put the pocket holes. And here's a look at it before any sanding or wood filler. After filling all the pocket holes and anywhere "wood meets wood" with wood filler, I sanded down the whole sha-bang with my sander . I also used the sander to round off the edges to keep things from looking sharp (I thought about routing it, but I couldn't justify buying another power tool for a bench). And that wonderful little sander was also used to put some character notches into the wood. This will keep it from looking extra new. I then put a coat of LowVOC Kilz primer on it. And lightly hand sanded it again. A few coats of Satin Black Enamel Paint and a coat of Minwax's Satin Polycrylic ....because both of those I already had on hand.....and then called her complete. Here it is in my entryway....and one day maybe it will look like the Pottery Barn inspiration pic....when I get brave enough to put that amount of holes in the wall around this. For now, I am happy with this....blank entry walls and all. I mean progress is progress, right??? No matter how long it takes to get there. Ooh, this looks amazing! I so need something like that in my living room! I'd love it if you came and linked up to the Do Tell Tuesday link party (it's live). This is too beautiful not to share! Looks SOOOOOO good!! Great job! 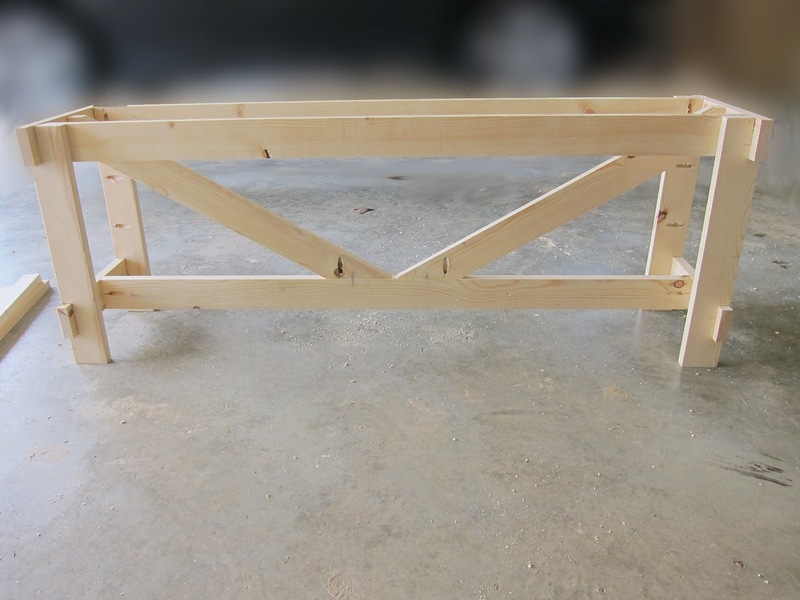 Teds Woodworking has more than 16,000 woodworking plans with STEP BY STEP instructions, drawings and diagrams to make all projects easy and simple!